Some jobs are better left to a robot. Imagine you are on a job site and your boss asks you to inspect a location that is almost impossible to get to. Even worse, it may be messy or even dangerous to access the location yourself. In times such as these, you may be better off leaving the job to an inspection robot. Many inspection areas, both at home and work, are simply impossible for you to get to. Often this is due to size restrictions; the location is small, and you aren’t. For instance, you may need to inspect duct work in an attic area. While this may be impossible for you, it’s no problem at all for a small inspection robot such as the SST Tracked Inspection Robot. This compact robot is about the size of a shoe box, and comes equipped with a mounted camera and lights. It also attaches to an LCD monitor so you can see exactly what the robot sees. Let’s say your town’s sewer system is blocked, and it’s your job to find out what is causing the hold-up. You could make your way down to the sewers on your own for a bit of ‘eyes-on’ inspection, but why? Instead you can send an inspection robot down the manhole to find out what is going on. 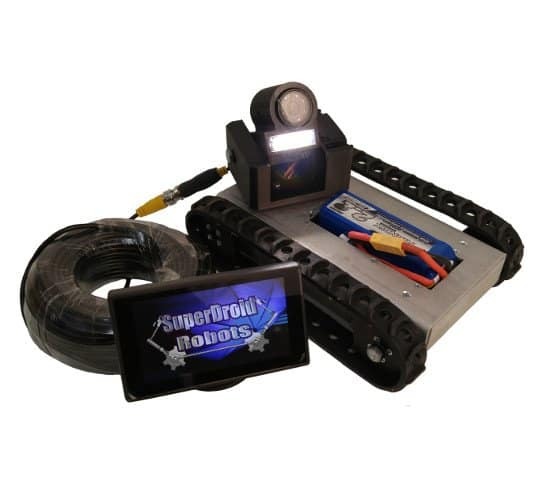 The SJT-32-W Treaded Waterproof Pipe and Duct Inspection Robot is the kind of robot that can tackle that task without breaking a sweat, or complaining about the mess. This robot was made for this! It can maneuver in spaces as small as 10″ diameter or larger, and on top of that, it’s waterproof. It has front and rear mounted cameras and LED lights so you can see where it’s going (and where it’s been) in both forward and reverse. Many inspection locations may not be messy or hard to reach, but instead are just too dangerous for you to access. In this case, you would be much better off letting a robot in on the action. In the case of a chemical or radiation leak, you really don’t want to be in an area if you don’t have to. SuperDroid Robots has an entire fleet of inspection robots that don’t mind the sometimes hazardous conditions that come with inspecting dangerous places. Robots are most valuable when they can effectively replace human involvement. If you have an inspection location that is impossible to access, messier than you want to deal with, or just plain dangerous to be around, then a robot is a safe way to get the job done. Do you have a situation that might call for an inspection robot? If part of your job involves site maintenance or inspection, then you definitely could use one. 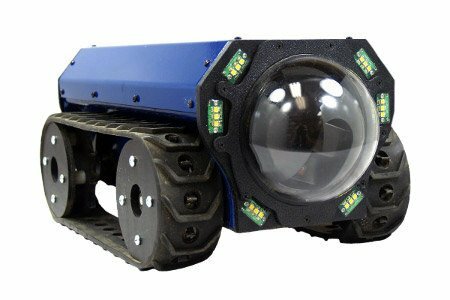 SuperDroid Robots can develop the survey or inspection robot you need in a timely and cost effective manner, so contact us today!